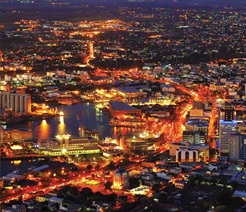 The electricity exported yearly by our power plants to the national grid of Mauritius represents just under 30% of the annual electricity generated in the country. 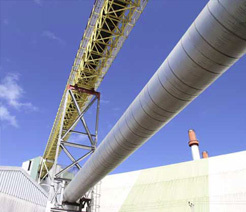 Furthermore, Omnicane produces 40% of the country’s renewable bagasse-based energy. Our main power plant at La Baraque is one of the largest bagasse- and coal-fired cogeneration plants in the world. It uses bagasse during the sugarcane crop period, and coal outside of the crop period to generate steam and electricity for the cluster and electricity for the national grid. Of the same type as the first but smaller, our second power plant at La Baraque uses woodchips and coal and caters mainly for the distillery’s requirements in both steam and electricity. 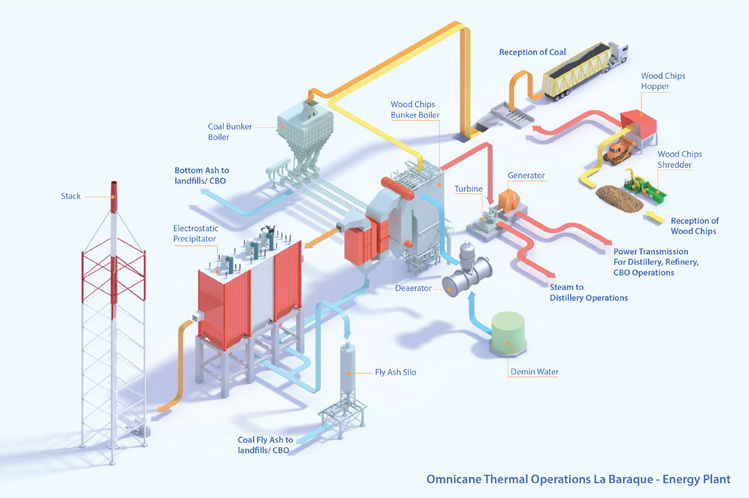 Omnicane's main cogeneration plant captures by-product heat from the combustion of bagasse and coal and transforms this heat into useful energy, namely steam and electricity. This dual fuel system allows for the non-interrupted production of energy throughout the year. Bagasse recuperated from the milling operations is used during the crop season. Coal, which is imported, is burnt during the inter-crop season. These 2 fuels share properties that allow the thermal plant to function with both combustibles without mechanical or structural alterations. When compared to traditional power plants, Omnicane's cogeneration plant reaches an efficiency of 80%. After the bagasse or the coal are conveyed to the thermal plants, a set of crushers and conveyors prepare and deliver the fuel to the power plant. The fuel is crushed into a fine powder which is blown into large boilers. The boiler walls are lined with pipes that are filled with water. As soon as the fuel enters the boilers, it catches fire instantly and burns with high intensity. This heat rapidly boils the water inside the pipes, changing it into steam. This process steam travels to the sugar complex. As the bagasse or coal burn, emissions and ash are produced. The gases, together with the lighter ash (fly ash), are vented from the boiler up into the stack. 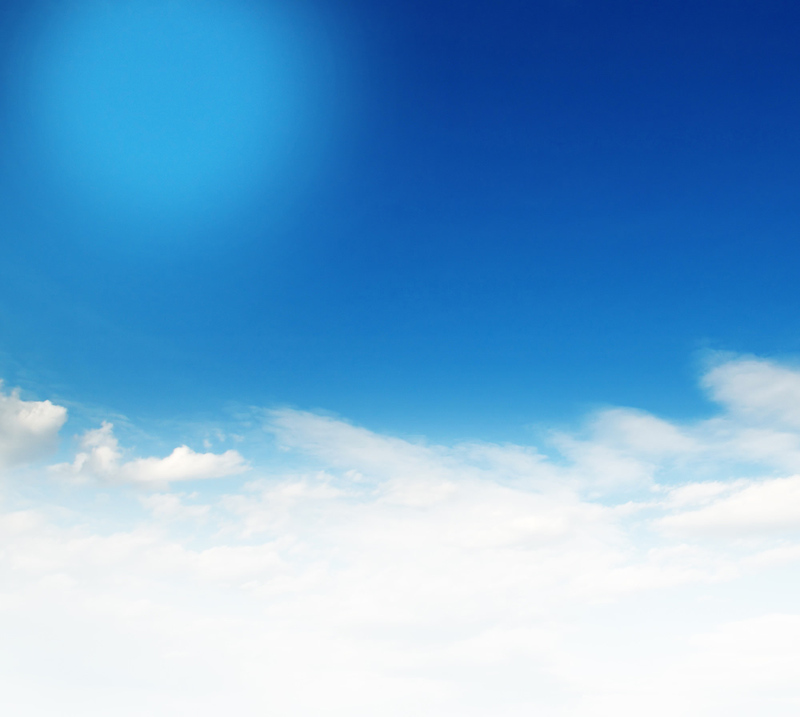 Air filters called electrostatic precipitators remove the majority of the fly ash before it is released into the atmosphere. The heavier ash (bottom ash) collects in the bottom of the boilers and is removed. Fly ash from bagasse combustion is sent to the fields to be used as fertilisers. This type of combustion produces very small amounts of bottom ash. In the case of coal combustion, the fly ash can be used as a cement additive and the bottom ash as rock sand in concrete. This re-use of fly ash and bottom ash will take place in the Carbon Burn Out plant. In the meantime, fly ash and bottom ash from coal combustion are disposed in meticulously managed land fills. Meanwhile, steam moves at high speed to the turbines. As jets of high-pressure steam emerge from the pipes, they propel the turbine to spin rapidly. A metal shaft connects the turbine to a generator and as the turbine turns, it causes an electro-magnet to turn inside the generator. The spinning magnet puts electrons in motion inside the wires, creating electricity. Part of the electricity travels to the cluster to power the milling and refinery operations. The rest passes through transformers to increase the voltage of the electricity that is generated. Transmission lines then carry the high voltage electricity to substations to be exported to the national grid. Our power plant at St Aubin produces electricity for the national grid. This coal-fired thermal plant is equipped with a condensing-type turbine and is in operation since 2005. 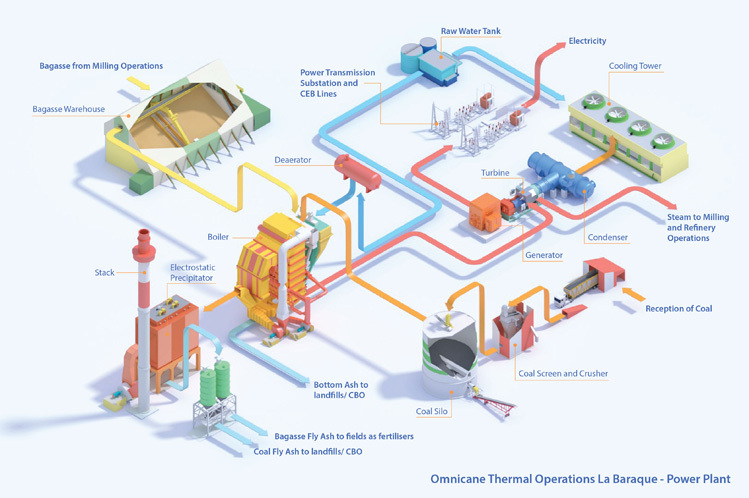 As in our thermal plant of La Baraque, the conversion of coal to electricity takes places in stages. The first is in the boiler when the coal is burnt to produce useful heat. The heat from the combustion then boils water in the boiler to produce steam of high pressure and temperature. The steam is pumped into a turbine which spins rapidly. 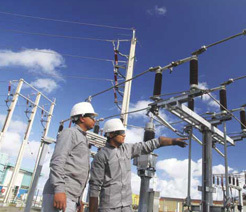 The electricity produced by the generator connected to the turbine is then exported to the grid. The steam leaving the turbine is condensed and the water is pumped back for reuse in the boiler.